It’s twilight on a day somewhere between 1505 and 1521. The sun is still as big as it is in 2019. But the challenge still remains the same. It’s not projecting history on screen, but how to execute that task? Historical films are nothing new to Sri Lankan filmmakers and no big deal for Professor Sunil Ariyaratne of Yasodhara blockbuster fame. History has thrived on the Sri Lankan filmmakers’ attention. We have seen enough of the Buddha’s time and Kandyan legacy on wide screen. But the Portuguese era? A question to rake your brains. Probably no film has been made on Sri Lanka’s first colonial rulers. And Professor Ariyaratne confirms that the era has not made its way to the stage or small screen either, let aside the widescreen. In 1521, three sons scheme against their father, Vaijayabahu the sixth. The elderly king is murdered and the kingdom gets divided among the sons: Bhuvanekabahu, Pararajasingha and Mayadunne. The reason is clear. It reaches the sons’ ears that the father intends to promote the son born of his second queen to the throne. This naturally earns the ire of the ‘rightful’ heirs. This historical narrative later made its entry into WA Silva’s most popular novel ‘Vijayaba Kollaya’. And Professor Sunil Ariyaratne decided to ignite the narrative on the wide screen. That was no easy task, he reiterates. The literature related to the Portuguese era is scarce compared to other eras. “We can make some guesswork on what the Portuguese wore during that period. But what of the Sinhalese? What about our archaeology that existed before their arrival? Our Art Director, Bimal Dushmantha, got himself entangled in massive research to find answers to these. Venuka Wickramarachchi has studied about costumes in Europe. Priyantha Weerakkody has done illustrations of the era. They made our task a bit easier,” Professor Ariyaratne remarks. History has not attracted that much of films as the social themes did. As Professor Ariyaratne mentions it is simply because of the funds. Vijayaba Kollaya team still had to make a great effort. Their lookout for a beach without buildings was even tougher. But slowly they reached the culmination of the 16th century. The shooting of Vijayaba Kollaya is now over. 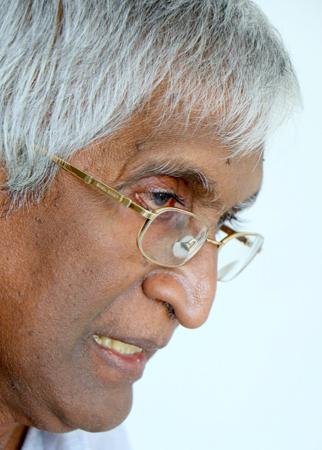 Besides all that, Professor Ariyaratne gradually began to admire WA Silva. Even after Martin Wickramasinghe made waves in the Sri Lankan cultural scene, beginning with Gamperaliya in 1944, Silva continued to have influence. For instance, Vijayaba Kollaya was a prescribed text for schools in the 1960s. Though dead and gone a long time back, WA Silva is still alive because of the cinematic works based on his novels. Classic examples include Kele Handa, Daivayogaya, Radala Piliruwa, Deyyange Rate, and Hingana Kolla. These cinematic works are instrumental, as Professor Ariyaratne emphasises because they enjoyed commercial success on par with the artistic worth. Vijayaba Kollaya is the first Sinhala film shot in the 3D technology. It will be screened at the 3D-enabled theatres.